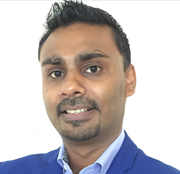 Audience insights and measurement platform Quantcast has appointed Rueben Vijaratnam as Regional Head, Malaysia. Quantcast applies machine learning technology and modelling to live first-party data drawn from more than 100 million online destinations, to help publishers better understand their audiences. Last year, the firm announced plans to offer its solutions in seven new markets across Asia - Hong Kong, Indonesia, Malaysia, the Philippines, Singapore, Taiwan and Thailand. Vijaratnam (pictured) joins in Singapore from Verizon-owned media and technology brand Oath, where he served as Head of Programmatic, before which, he worked for digital marketing agency AdParlor as Country Director - Malaysia. Prior to this, he spent more than six years at Yahoo!, where he latterly worked as Manager, Sales Partnerships and Strategies - SEA. In his new role, Vijaratnam will lead business growth across key agency groups and clients across Malaysia. He will report to Chris Scudder, Commercial Director of Southeast Asia and Greater China, who comments: 'Rueben understands the market, the opportunities and challenges that agencies and brands face, and will be instrumental in building out our local strategy and executing this across the Malaysian region. With Rueben's calibre, coupled with Quantcast's increasing product offering, we are looking forward to fulfilling our potential in this region'.